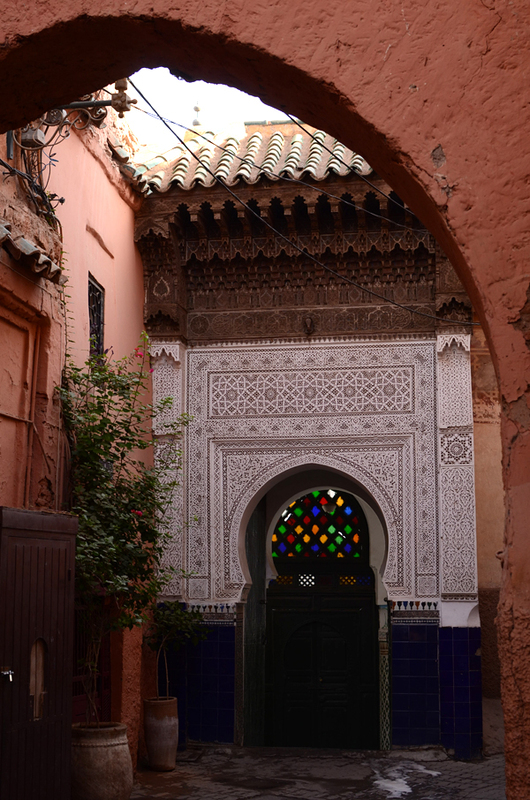 Soon after coming back from Madagascar we went to another trip - to Morocco again. The main goal was to make the final arrangements for the 2nd International Mindat.org Conference. 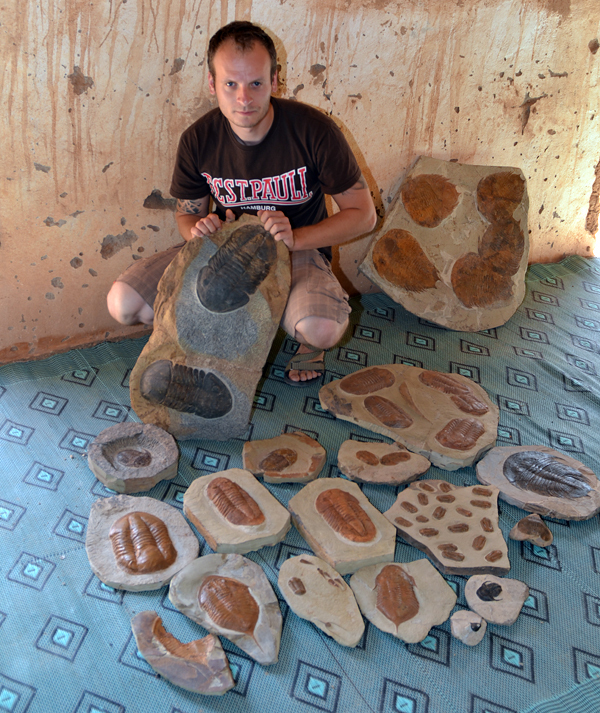 Together with my “fossil oriented” friend Piotr, we spent 10 intense days in Morocco. 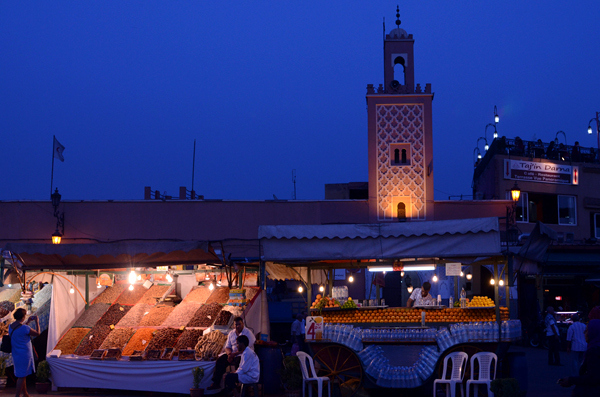 We landed in Casablanca in the middle of night and this time we decided to try other hotel than we had used to. 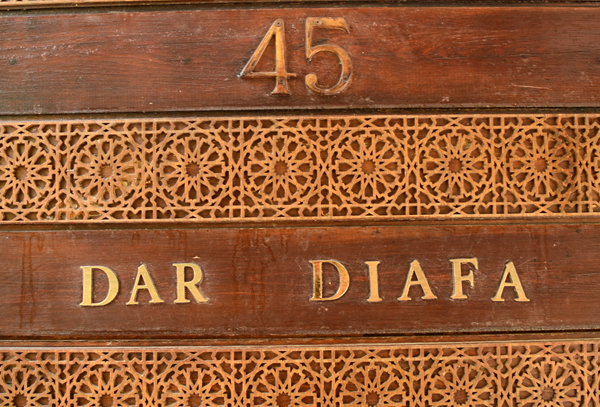 Ben picked us up and we drove to the Dar Diafa which really surprised us with quality and aesthetics. 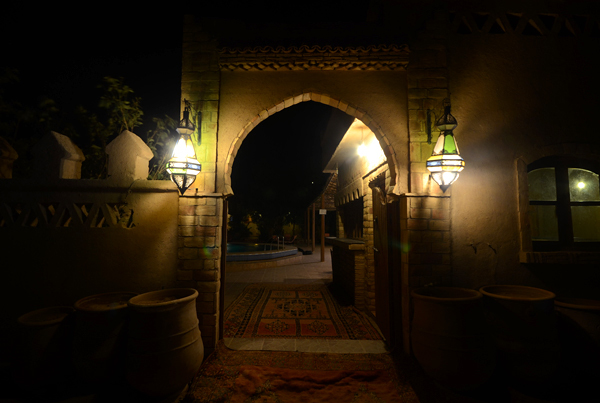 This small micro-hotel (there are only 2 or 3 rooms) combines modern luxury and traditional Arabian-Moroccan style. Even small swimming pool is placed in a micro-garden! 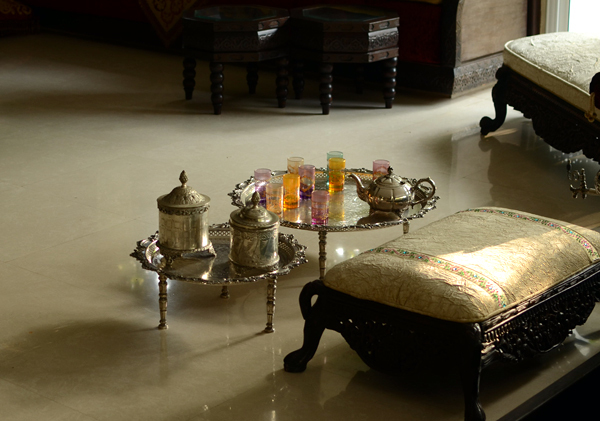 I can truly recommend it to all visitors. 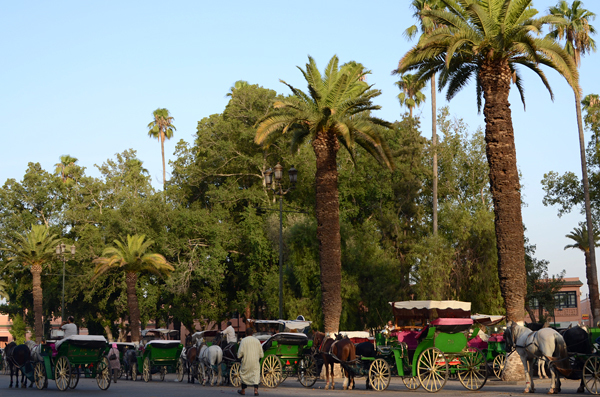 Next day we drove to Marrakech where we stayed for the next 2 nights. 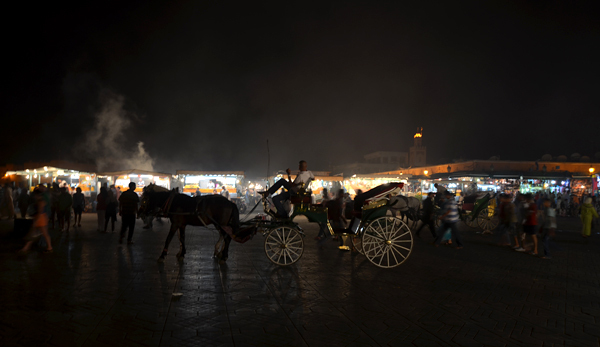 We spent most of our time in Marrakech and the whole that trip discussing with hotels` and restaurants` owners, guides etc. 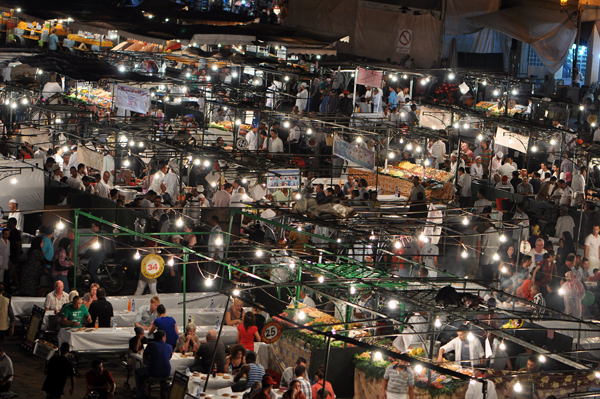 Fortunately, we found some time to make a tour in Medina and Jemaa el-Fna. We also visited Sidi Rahal to discuss the last details of the visit of Conference participants. We were lucky to acquire some interesting perimorphoses and pseudostalactites that this basalt occurrence is famous for. 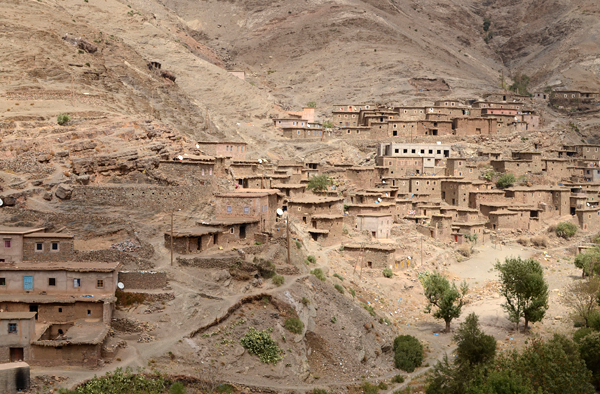 From Marrakech we drove through High Atlas and Tichka pass, setting photo-stops, checking the quality of toilets and restaurants for the upcoming trip. 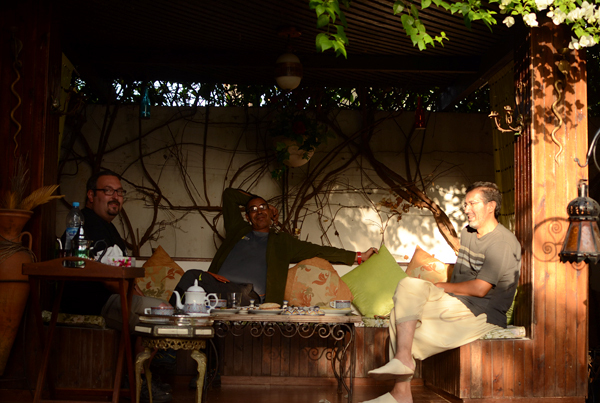 After a long drive, in the evening we finally arrived to Bou Azzer. 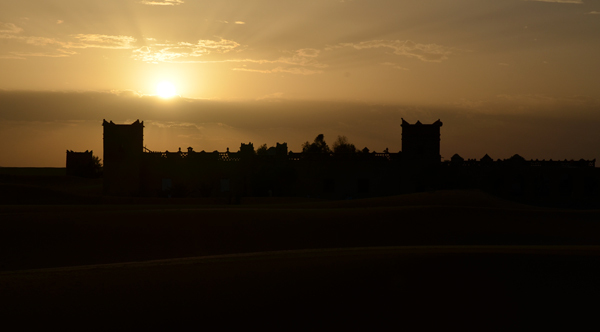 View to the main shafts at sunset was quite unusual and we spent some time taking photos. We spent the next day on counting the driving time between each locality we were going to visit during the conference, but also selecting some good quality roselites from Aghbar mine and gersdorfites from Ait Ahman. 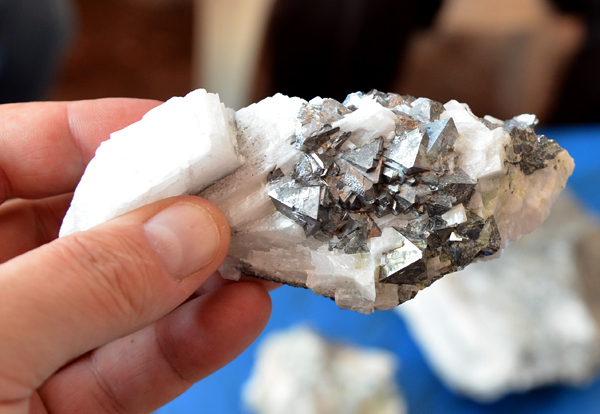 We saw also some new good Co-calcites from Agoudal mine, but their prices were so crazy that we gave up on them. 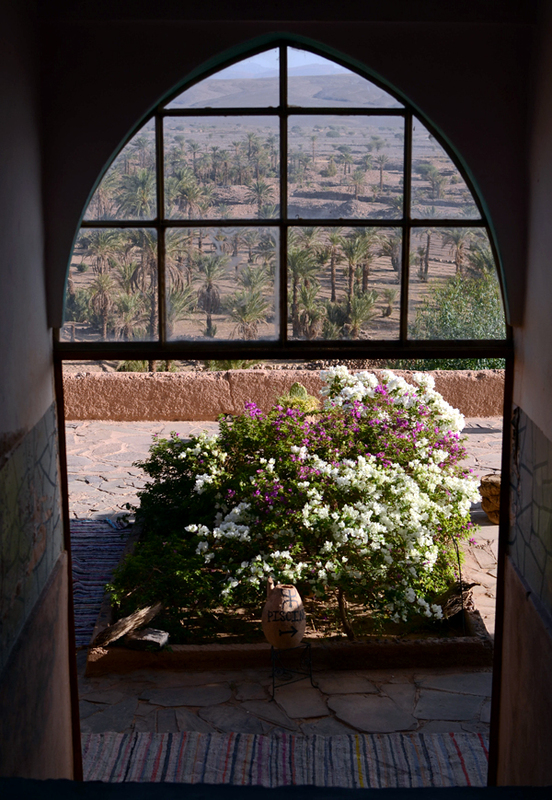 Late at night we arrived to a small hotel in Nkob on the way to Erg Chebbi. Next day was dedicated mostly to Piotr`s interest – fossils. He went through hundreds of trilobites and other fossils shops buying quite a lot of them. We also made a short visit in Hotel Meteorite to make the final arrangements and Jebel Issimour to be sure that condition of the road there was still OK. Next short stop was in Alnif town. 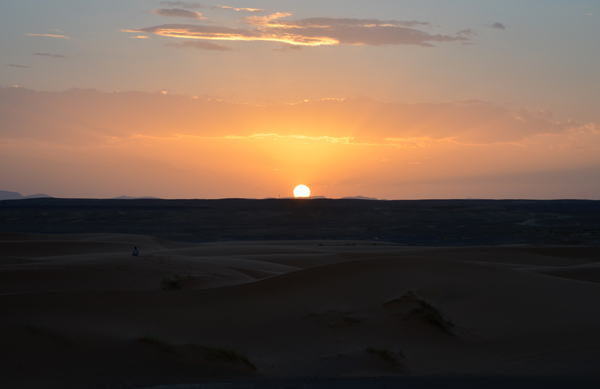 After another short stop for famous fresh orange juice in Ben’s place we drove to the edge of dunes. 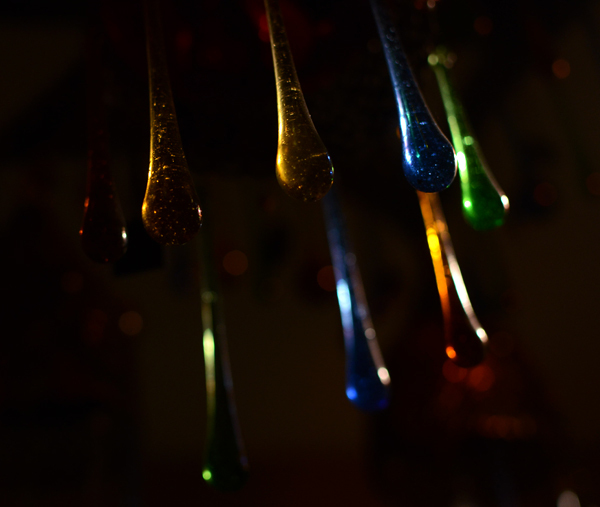 It was already about sunset so we spent some time taking photos. 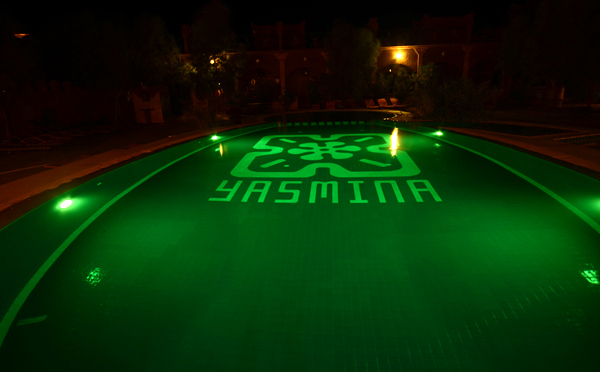 We spent the evening in Yasmina hotel where we had to discuss a lot of details of our 2 day visit there. 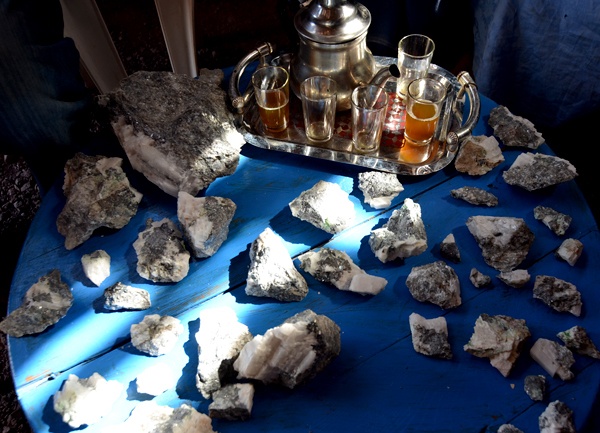 Next morning first we visited Taouz to organize mineral show for the Conference and see what was new there. 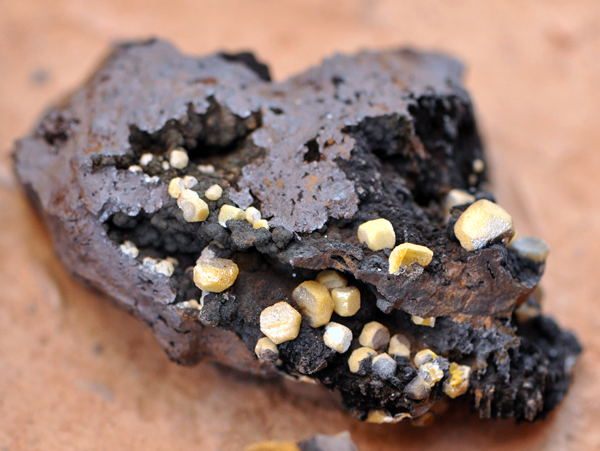 The interesting thing were mottramites on Mn-oxides and unusual canary-yellow to orange vanadinites. Most people base their description on appearance of this mineral so it is often described as mimetite, but analysis confirmed them as vanadinites. 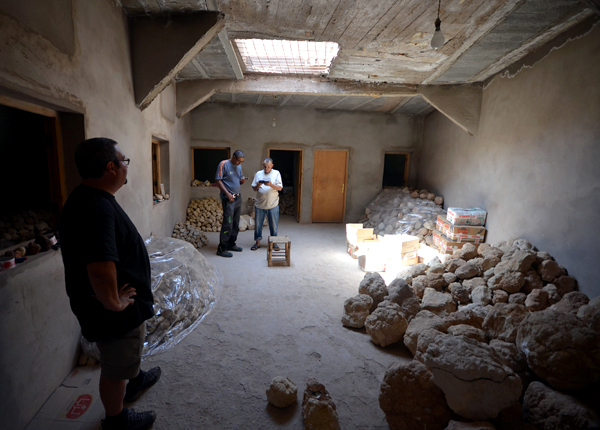 After a short stay in Erfoud and buying more fossils by Piotr we went to the Hameda quarry near Jorf to fix details of the visit of the Conference attendees. 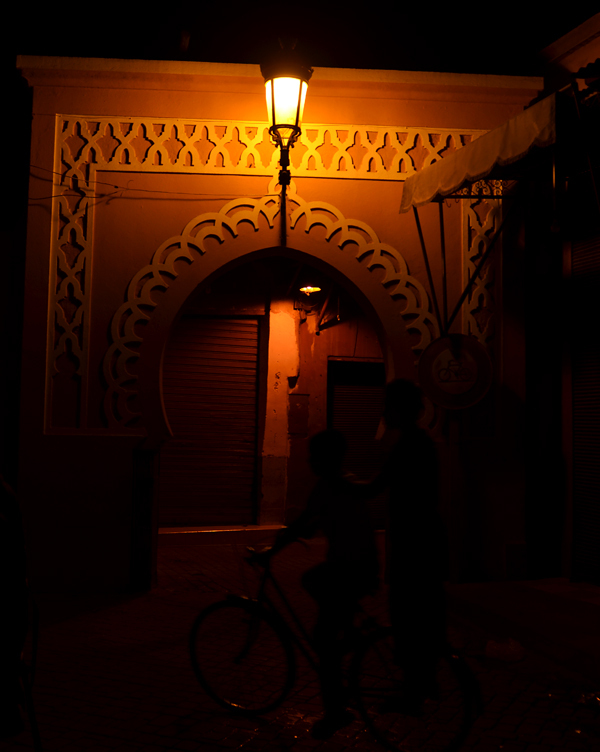 After that, tn the late evening we arrived to Goulmima town where we spent the night. In the morning we drove to Asfla village located north from Guolmima. 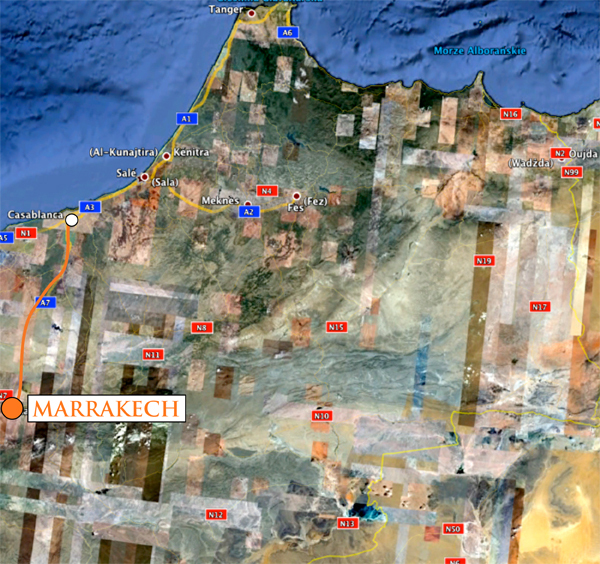 This place is one of the famous fossil rich lagerstatte in Morocco. 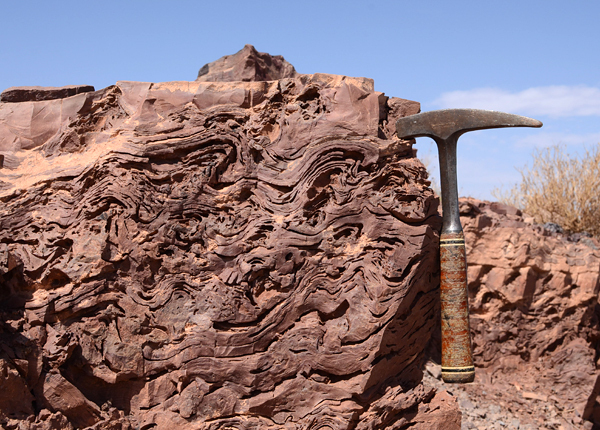 In Cenomanian (Upper Cretaceous) marls frequent concretions are present. 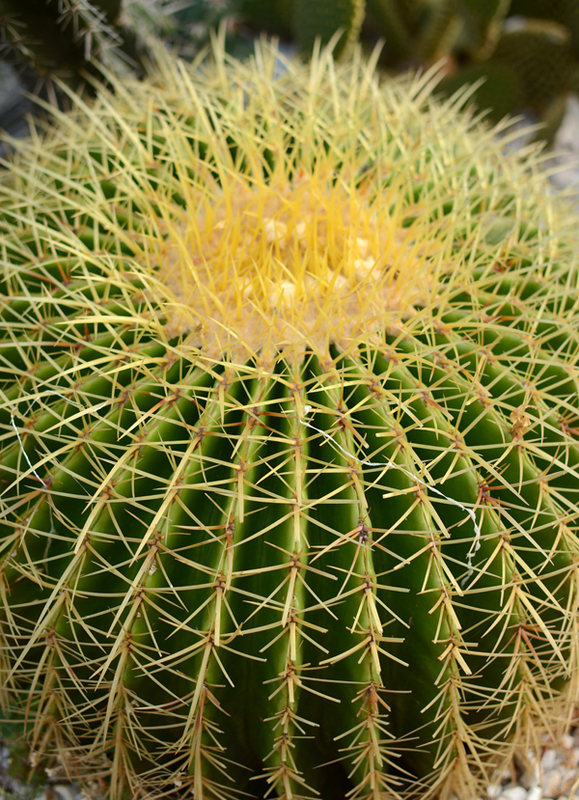 They usually contain ammonites, bivalves, rarely small fish. But what they are really famous for are huge fish (up to over 1 meter) and reptiles which can be even bigger. Piotr acquired several nice specimens. After that we went to a secret place where huge dinosaur bones can be found. Some of the remains offered to us where really impressive – some vertebras were over 30 cm in diameter, and the longest bones were around 2 meters! Piotr bought the biggest one and it barely fit in our car. We were really overloaded. 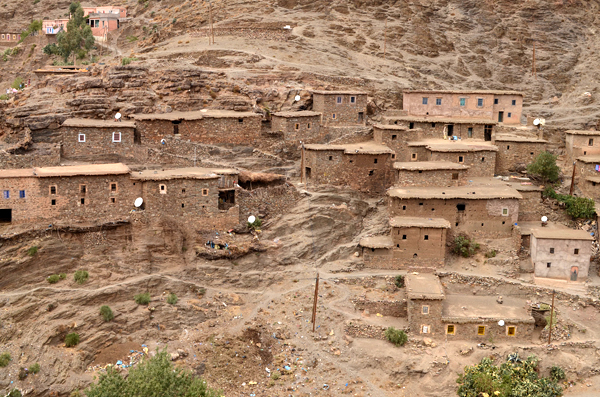 We continued our drive through High Atlas and finally arrived to Midelt. The same afternoon we made a short visit in Sidi Said - locality which used to produce great yellow cubic fluorites on quartz, but it was a long time ago. Unfortunately it is now another dead location. Midelt was planned as our main base for the Conference, we were planning to stay there for 6 days so we spent next two days discussing the final details of the visit. Counting hotel rooms, planning each evening, menu for each day, and finally field trips to locations around and a special underground party. We found time to visit some local dealers but we were surprised how few better quality specimens were available. 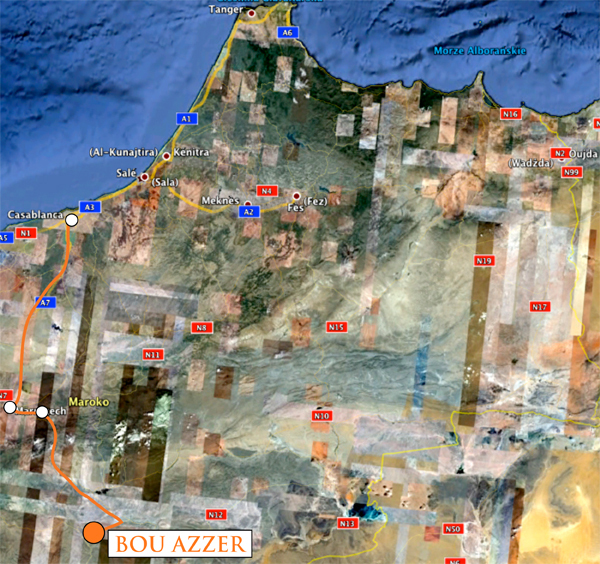 Flood of blue barytes from Nador area was finished, no new good vanadinites or Bou Azzer pieces were available. After all that super-intense and not too exciting days (discussing all menus, hotel rooms etc. is not our real hobby) we had 3 days that we reserved to see some new localities and verify new finds. 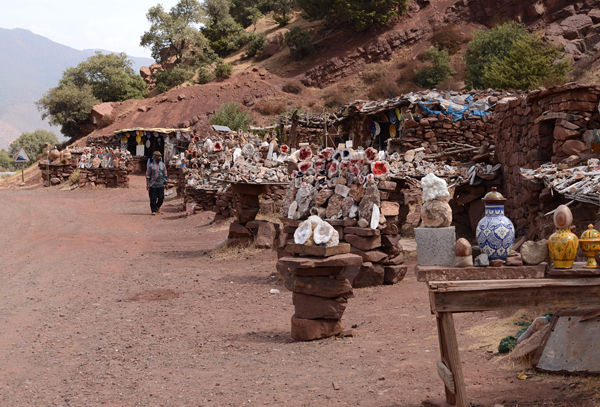 We drove from Midelt to the Taourirt area to visit Jebel Tirhemi which is one of the most mysterious fluorite localities in Morocco. This small mountain is made of Lower Jurassic limestones. We found 2 working quarries on the hill but unfortunately they do not produce any specimens. 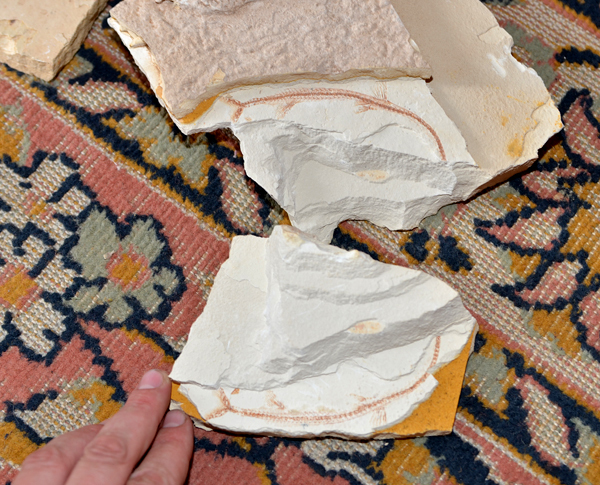 After longer research we finally found baryte-fluorite veins which where all abandoned. 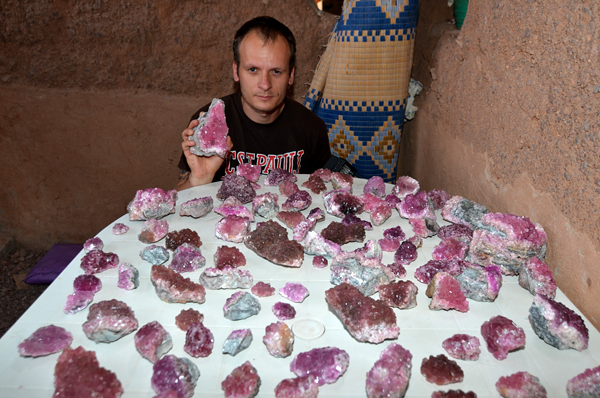 It wasn’t very difficult to find fluorite crystals, they occured in many places. 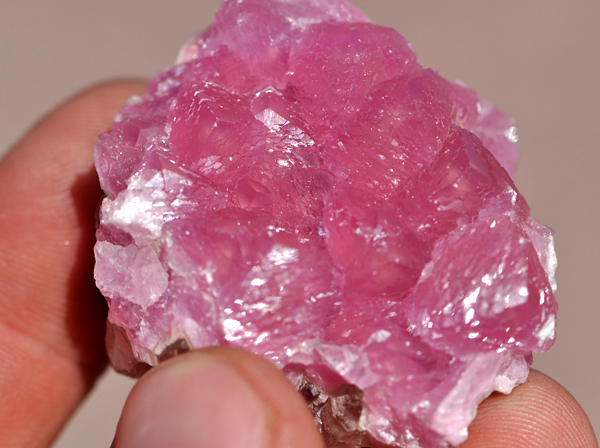 Usually they are transparent or pale purple, associated with white baryte blades. Questioning some locals we were informed that majority of good specimens came from the main underground tunnel which is still in good shape. 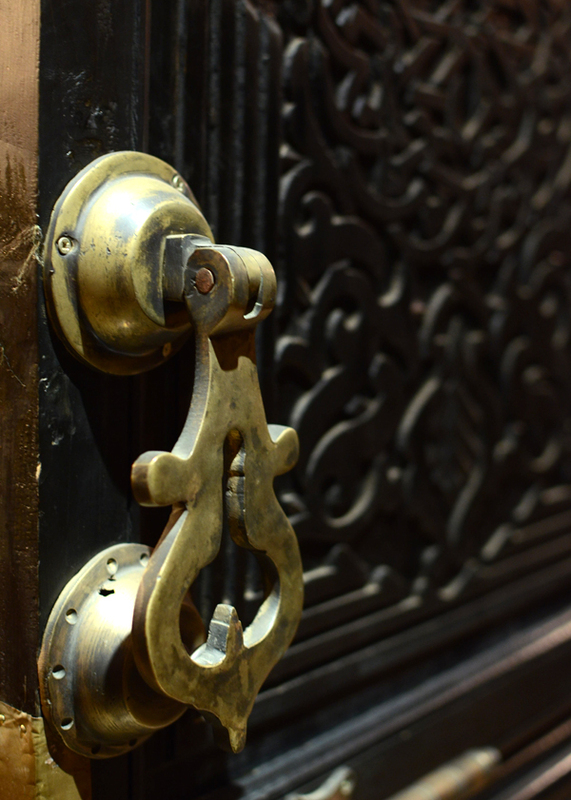 Unfortunately, we had no time to examine it closer… next time… Anyway, for now locality is abandoned and there is no serious perspective that it will be reopened. 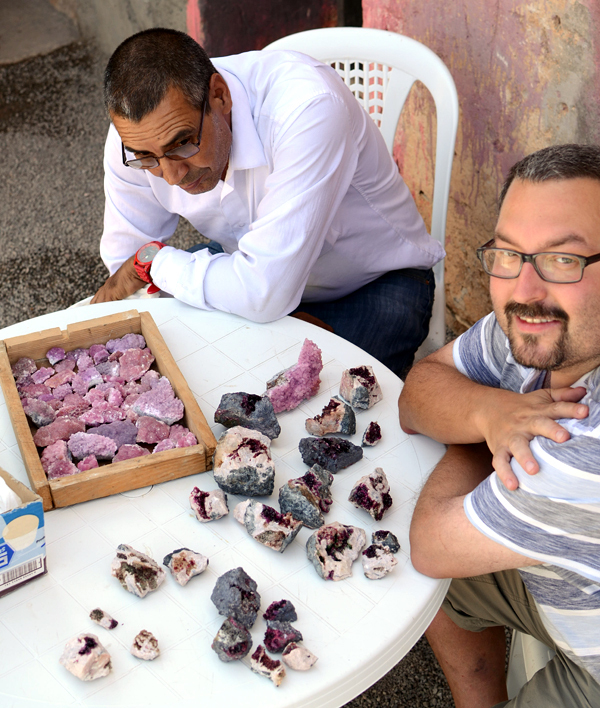 We spent a night in Oujda, visiting some local retired mineral dealers but apart from some good stories from the past we didn’t find anything interesting. Next day we were planning to visit Bou Bekker workings (see more about them here) but after we wasted a lot of time playing with local bureaucracy we decided to spend that day on geo-tourism - visiting famous shafts and workings in the area. Unfortunately, all world-famous places do not exist, head-frames are destroyed, declines collapsed etc. 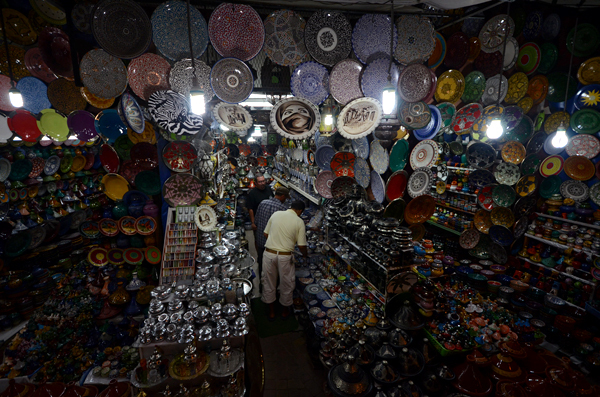 We spent our last day in the Nador town area. 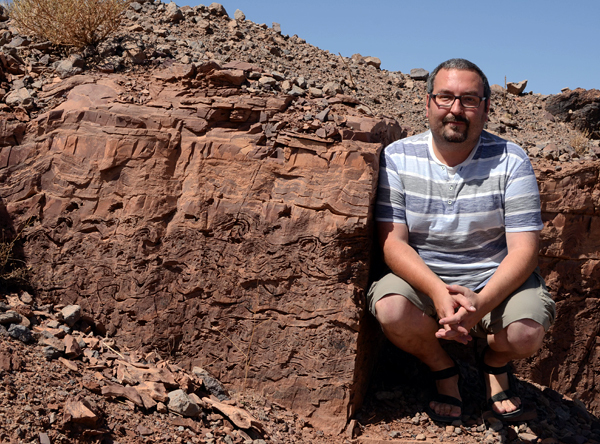 The main goal was to find real locality of the new blue barytes. 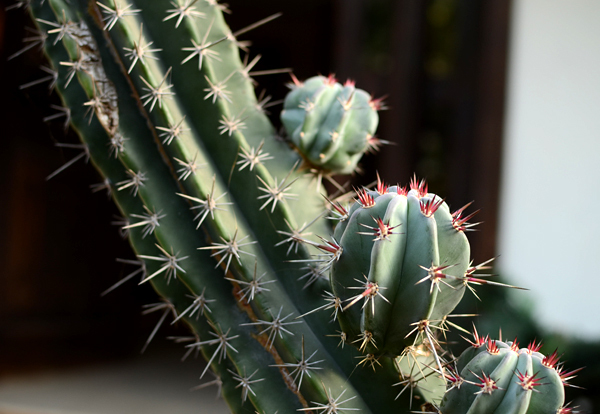 There are many localities given to this specimens at the market. After long research we found out that they had been coming from one of many, many workings in the Segangan and Jebel Ouichane area. This zone was very expanded years ago, it was a huge mining area where Fe ores were mined. 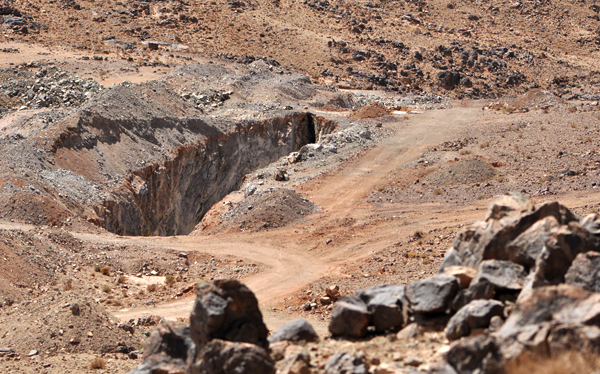 Many quarries and underground workings still dominate the landscape, including the biggest quarry located close to the top of the Ouichane Mt. After loosing some time investigating smaller quarries we arrived to the big one, where after some research we found the mysterious locality. The quarry is very deep and extended, baryte occures there in 2 small zones in one of the lower horizons. 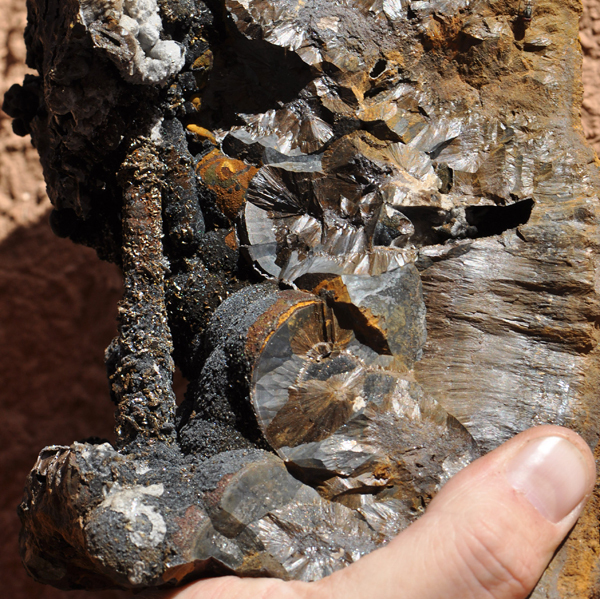 It occurs in the highly weathered Fe-oxides, we found many broken crystals and some still in situ. Soon we realized that both places were almost exhausted, and this is why the new specimens are of low quality and almost completely broken. There is still perspective to find new baryte rich zones in this huge mining area, but old places are almost gone after their short but intense life. We had our flight in the middle of the night so we still had some short time in the town. We decided to spend that time on investingating the other mysterious locality - with hematite. After questioning many locals we finally discovered where it was located. 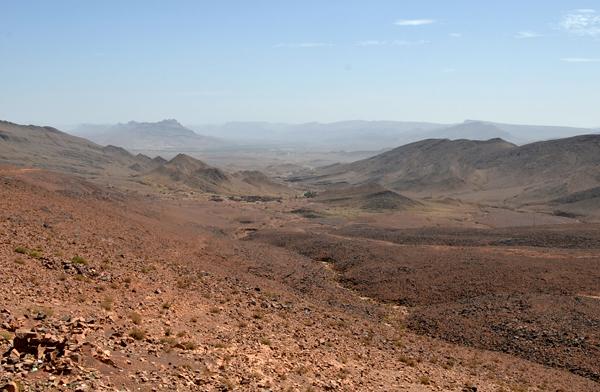 In all literature and on dealers` labels the hematite locality is given as Jebel Ouichane, Segangan – so the same place where barytes were found. 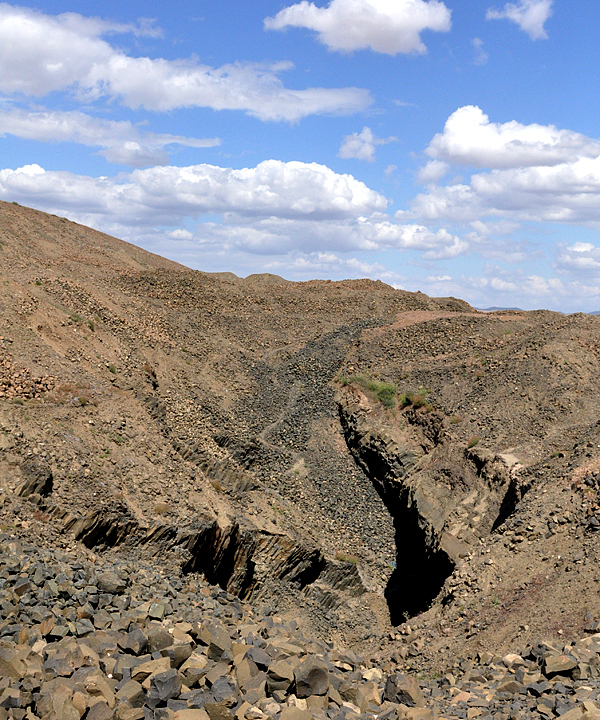 Sounds logically – quarry for Fe ore and hematites (Fe oxide) occuring together. But here is the surprise – hematites come from completely other places, located around 10 km from Ouichane, almost in the town center! In northern part of the town, on one of the small hills, there is an old quarry in which villas and small buildings were built years ago. Quarries were clearly abandoned many years go. 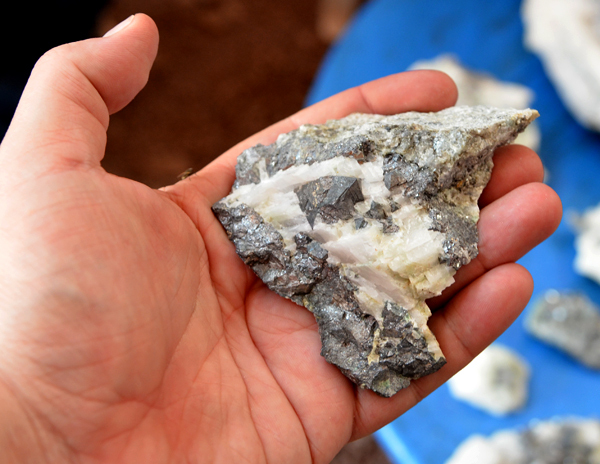 But the rich hematite mineralization is still present on the white volcanic rocks. 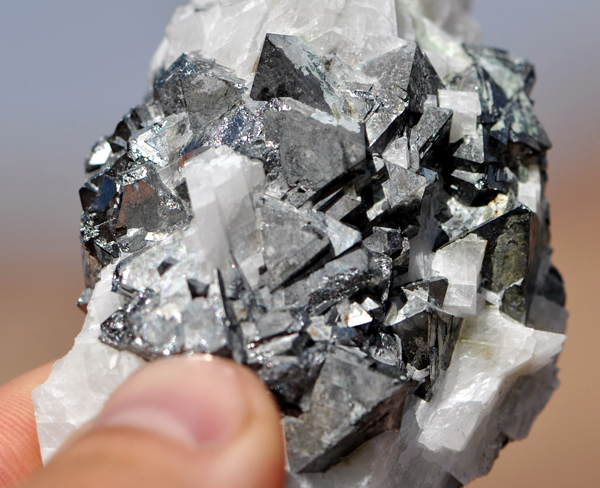 There are several big joints and cracks in the quarry wall, their surfaces in some places are completely covered with sparkly, small hematite crystals. Apparently they had been cleaned from the bigger ones, but in some inaccessible places crystals up to 3-4 cm are still present. 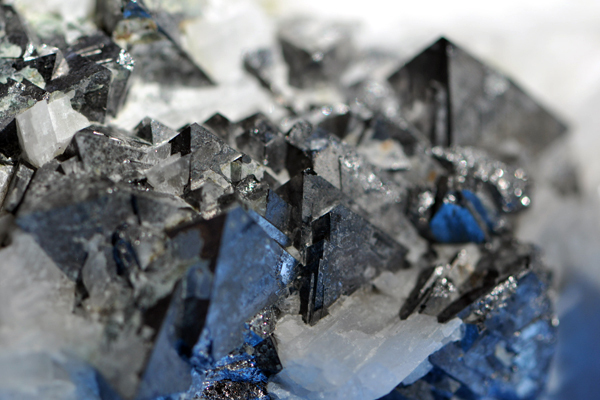 What’s more, there is plenty of small lustrous hematite floaters and broken crystals in the talus. It shows how productive this places used to be when the quarry operated. According to the house owners no one had visited the place for the last few years and it was forgotten. After a very long and intense day we barely got to the airport on time and reached our plane to Casablanca. 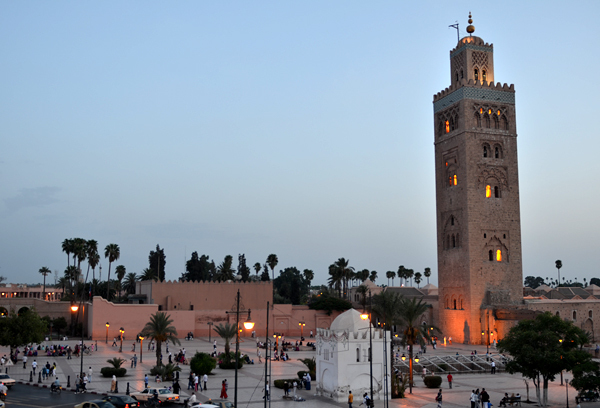 In Casablanca we spent a few hours and without sleep took our flight to Paris and than to Warsaw. 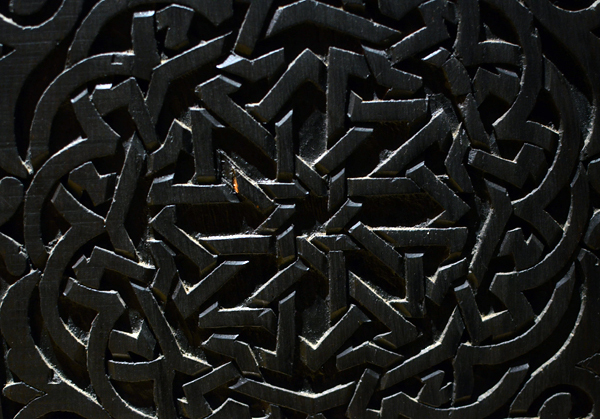 It was an unusual trip to prepare the unusual event (report from the Conference is coming soon), we were also lucky to track two mysterious localities which have never been documented in any papers or publications before. 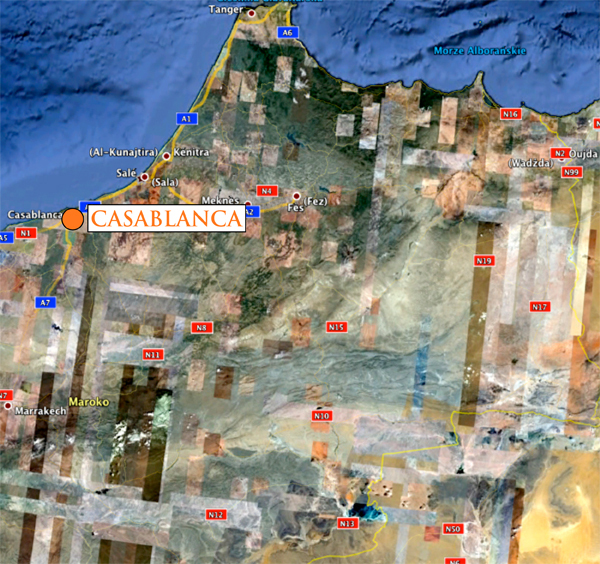 We started our trip landing in Casablanca. Google Maps. 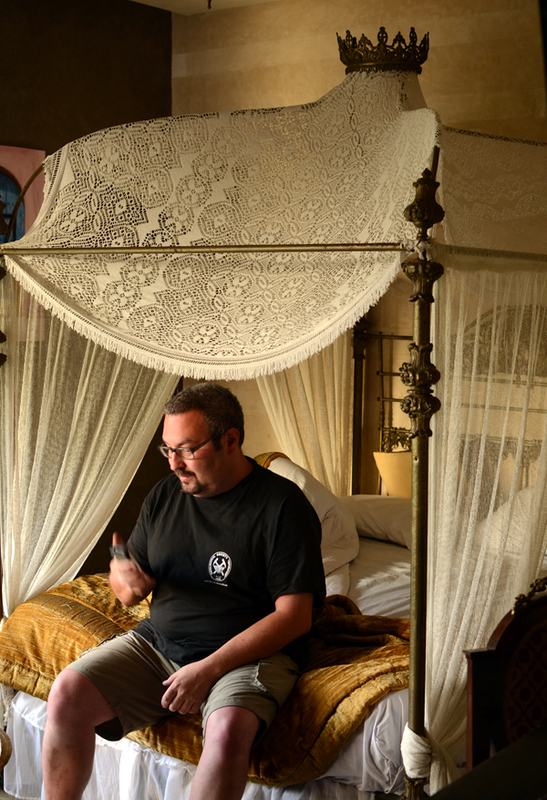 In Casablanca we slept in a new small hotel - Dar Diafa - we truly recommend that place. P. Menducki photo. 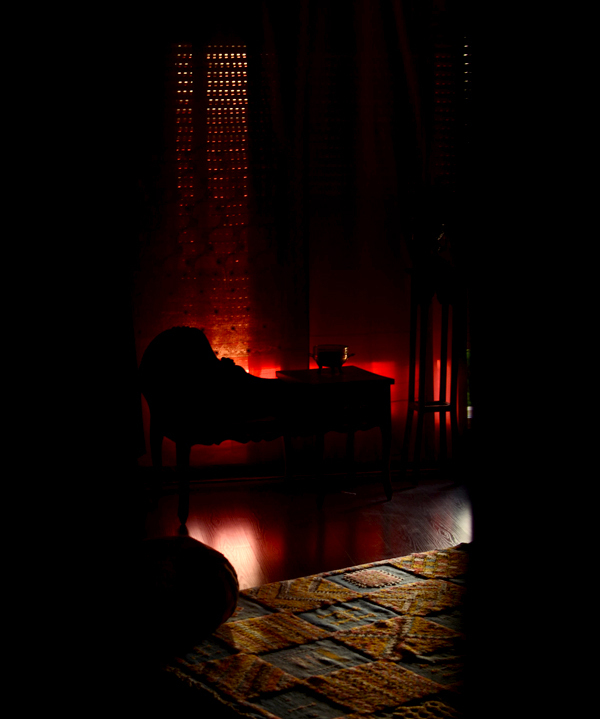 Hall in Dar Diafa. P. Menducki photo. 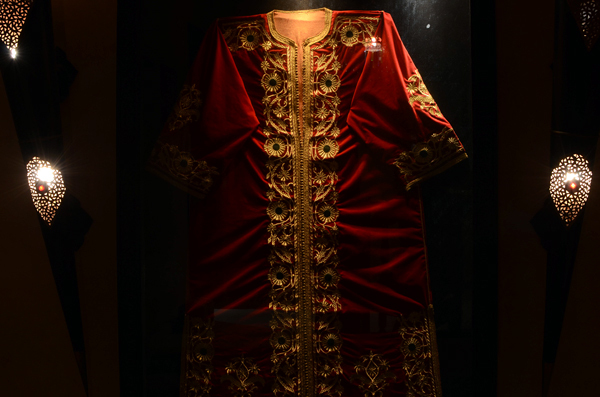 In Dar Diafa. P. Menducki photo. 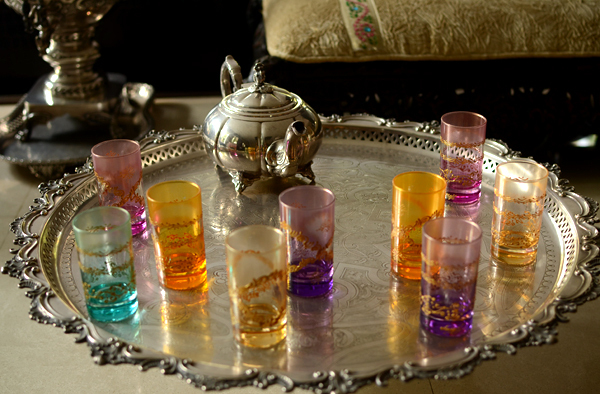 Tea in Dar Diafa. P. Menducki photo. King`s bed ;-) P. Menducki photo. 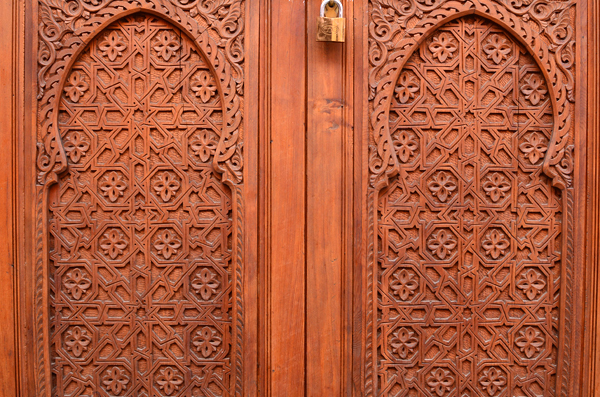 Details of architecture in Dar Diafa. P. Menducki photo. 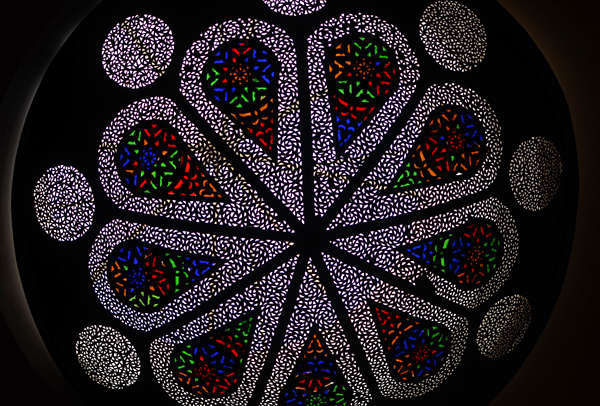 Lamp in Dar Diafa. P. Menducki photo. 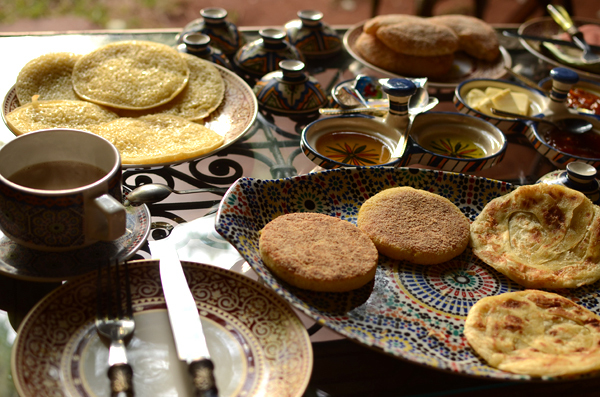 Breakfast in Dar Diafa. P. Menducki photo. 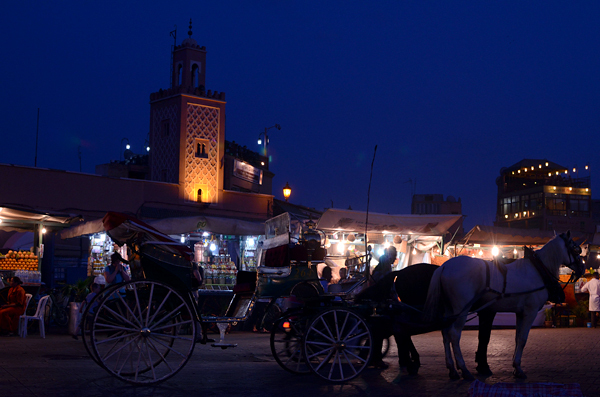 From Casablanca we went to Marrakech. 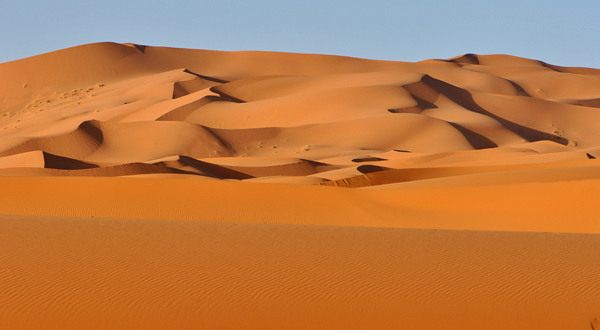 Google Maps. 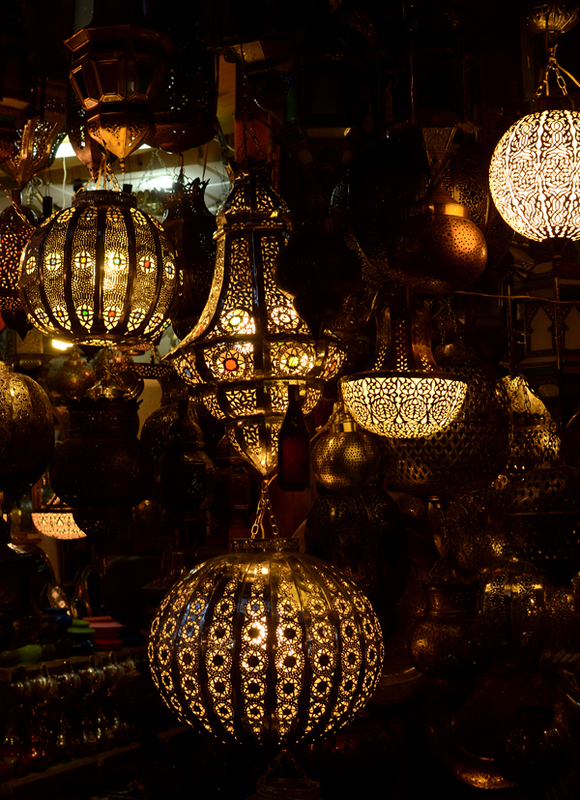 Our first stop was in Marrakech where we were fixing last details for Mindat Conference. P. Menducki photo. 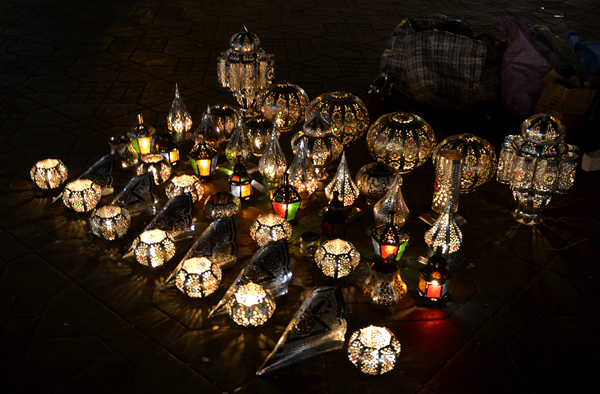 At medina streets. P. Menducki photo. 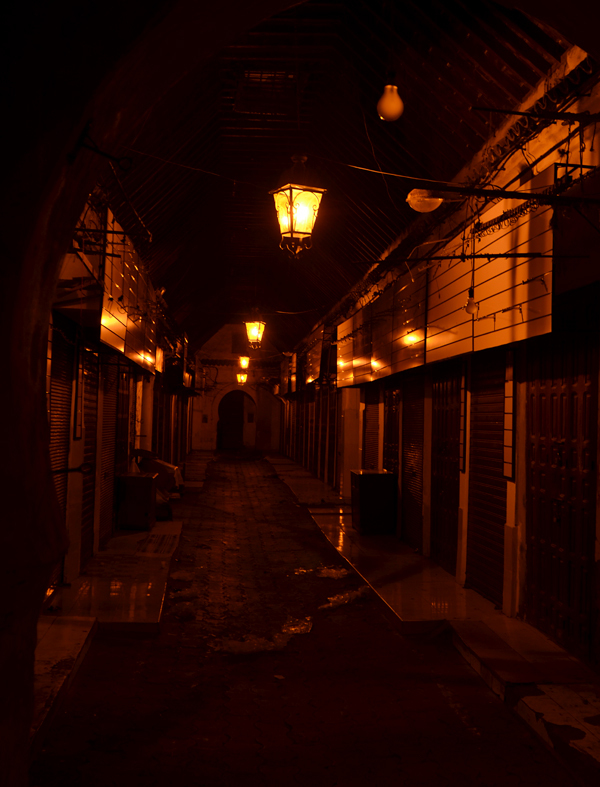 In the medina. P. Menducki photo. 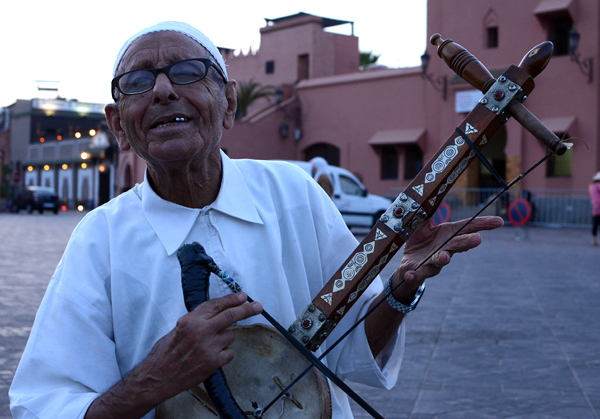 Musician in the medina. P. Menducki photo. 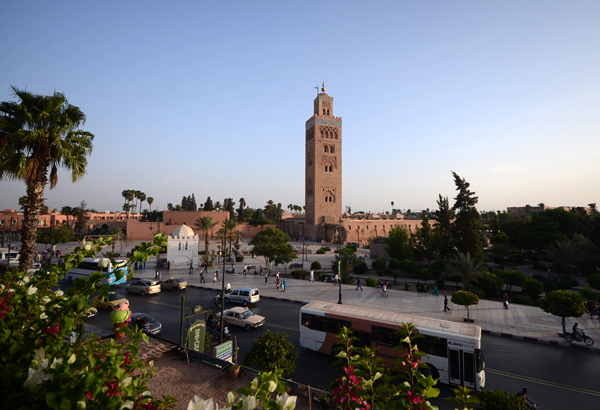 View to Koutoubia Mosque. P. Menducki photo. 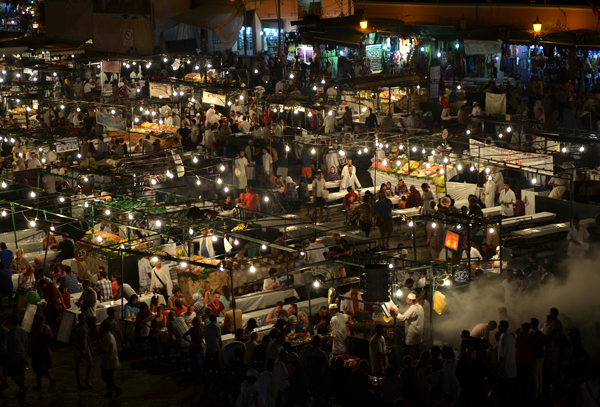 Jemaa el-Fnaa during the day - empty and quiet place. P. Menducki photo. 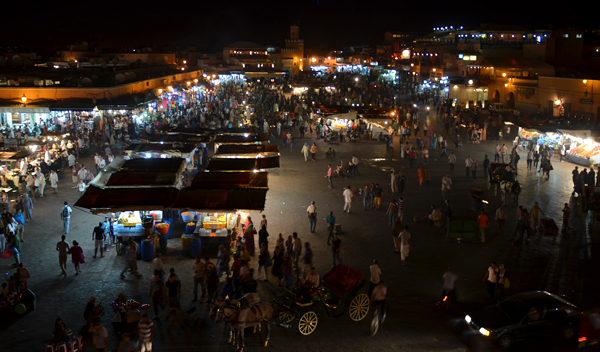 Jemaa el-Fnaa a few hours later - crowds spending time in restaurants. P. Menducki photo. 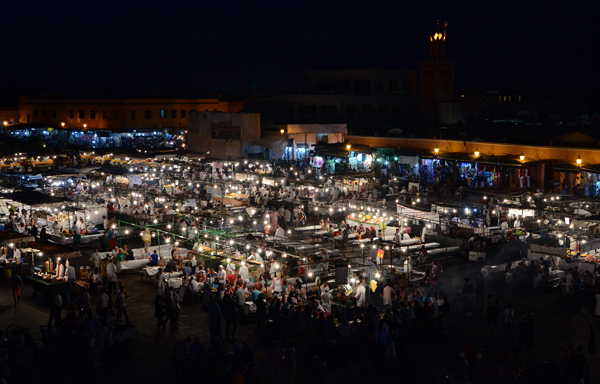 Evening at Jemaa el-Fnaa. P. Menducki photo. 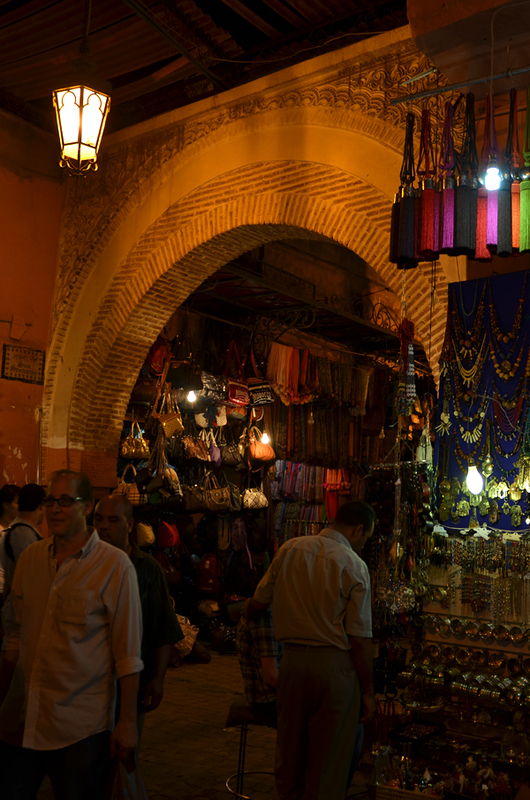 Evening visit in Marrakech souk. P. Menducki photo. 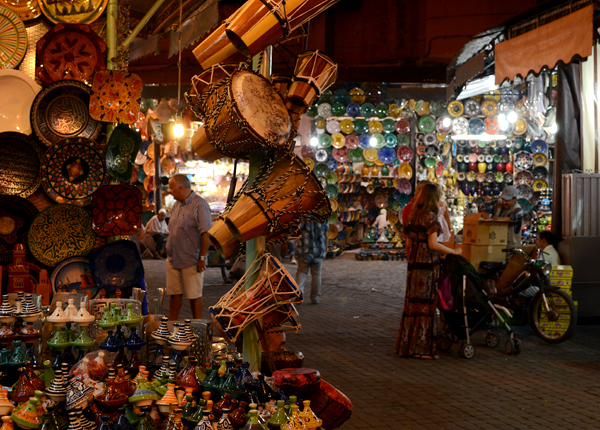 Evening visit in the souk. P. Menducki photo. 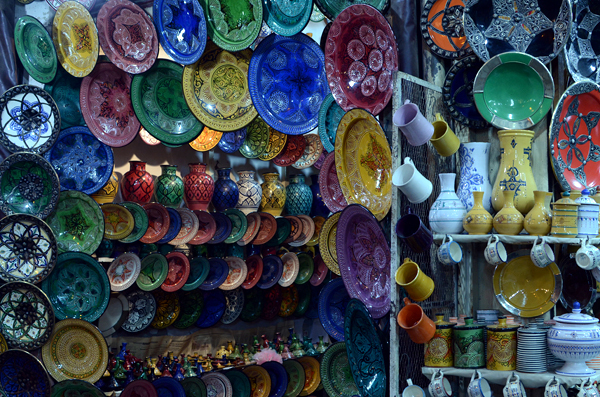 Pottery shop in the souk. P. Menducki photo. 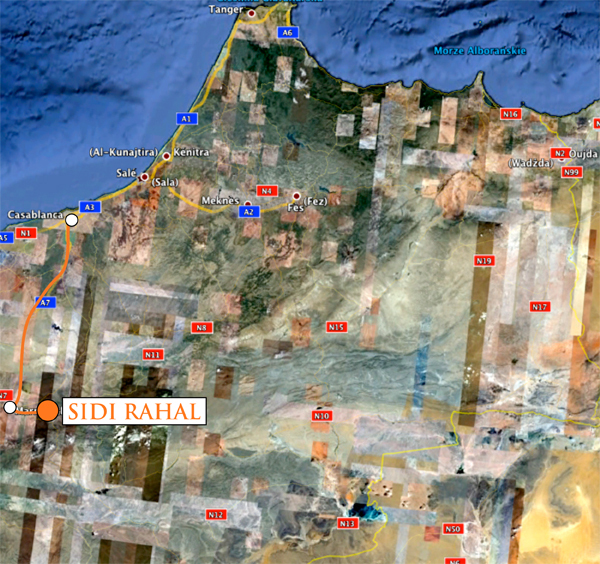 Next stop on our way was Sidi Rahal. Google Maps. 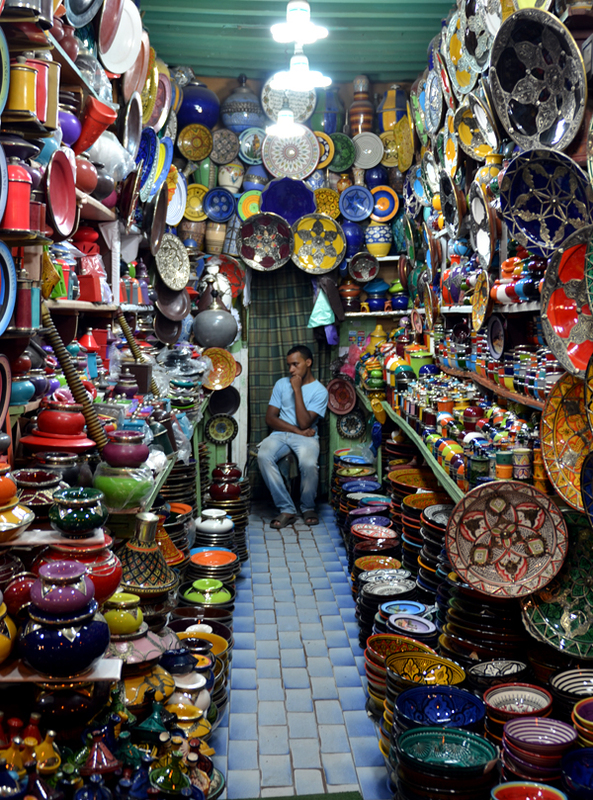 Sidi Rahal. P. Menducki photo. Pillar joint in Triassic basalts in Sidi Rahal. P. Menducki photo. 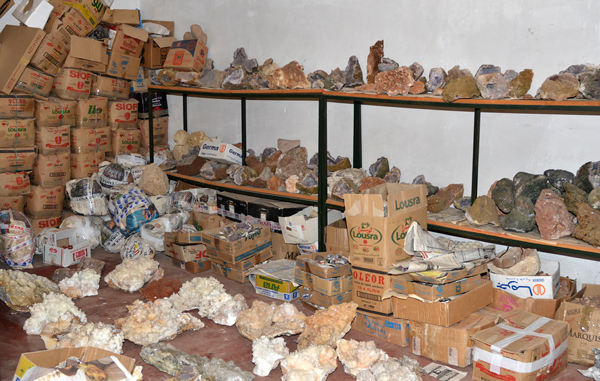 "Dumps" of speciemns in one of the dealers` stores. P. Menducki photo. 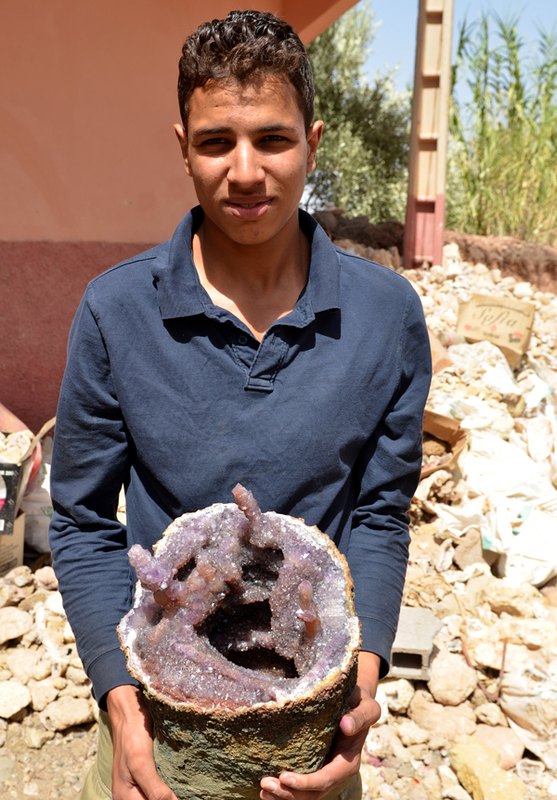 Geodes from Smara offered for sale in Sidi Rahal. P. Menducki photo. 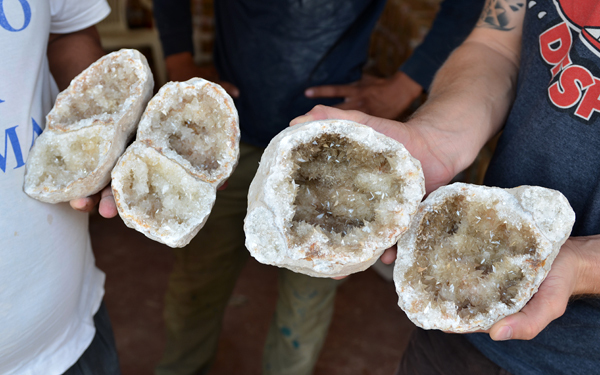 Geodes with calcite from Smara. P. Menducki photo. 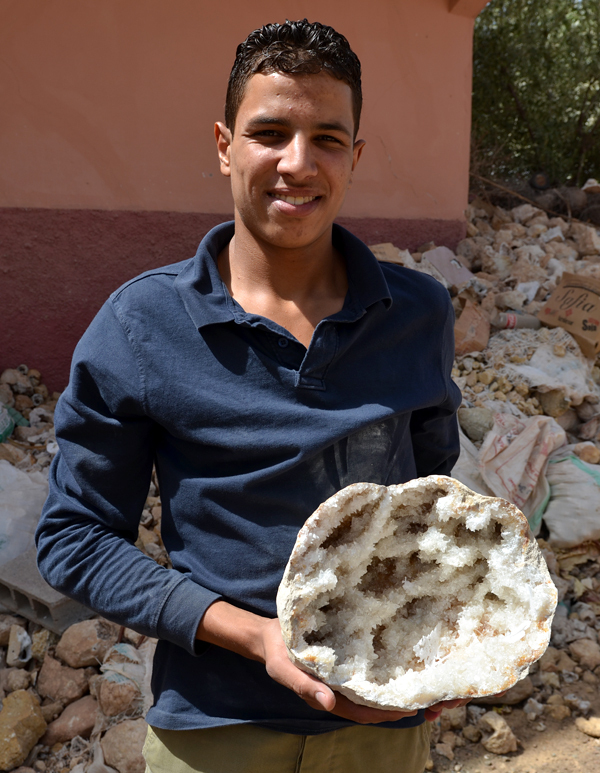 Geode with calcite from Smara. P. Menducki photo. 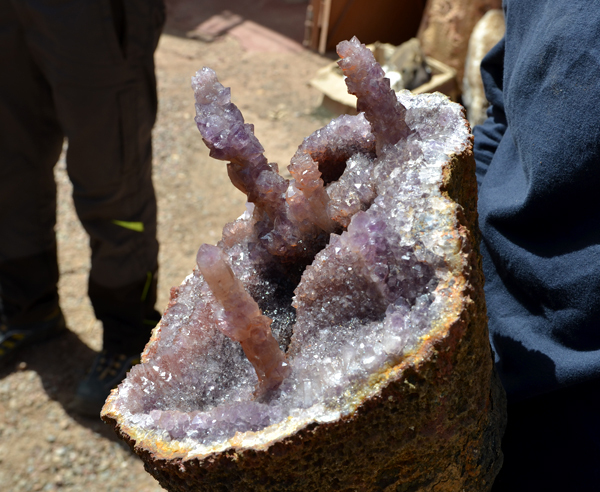 Unusual specimen from Sidi Rahal with pseudo-stalactites and perimorphs. P. Menducki photo. 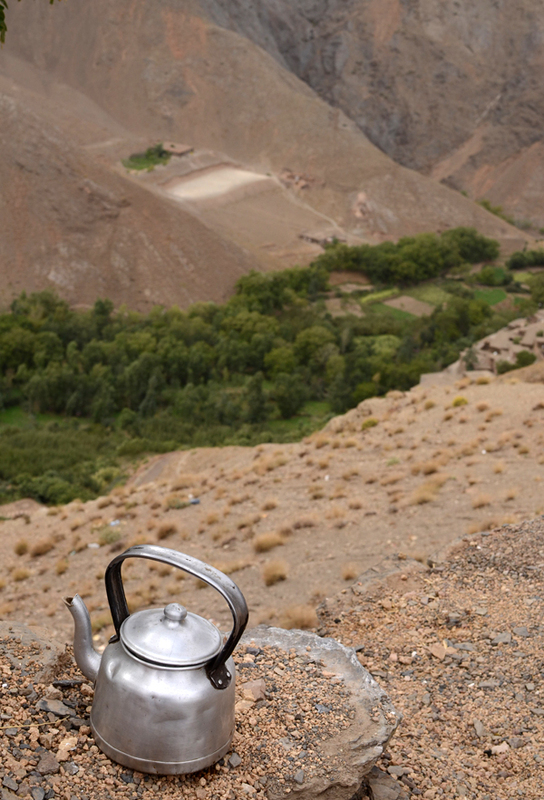 From Sidi Rahal we took a long drive to Bou Azzer crossing High Atlas Mts. Google Maps. photo-stops for the Conference. Google maps. P. Menducki photo. 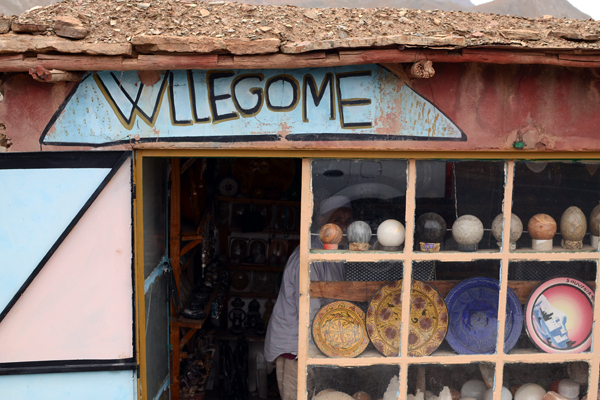 On the way through High Atlas. P. Menducki photo. View to Agdz. P. Menducki photo. Precambrian age stromatolites near Agdz. P. Menducki photo. Precambrian age stromatolites. P. Menducki photo. 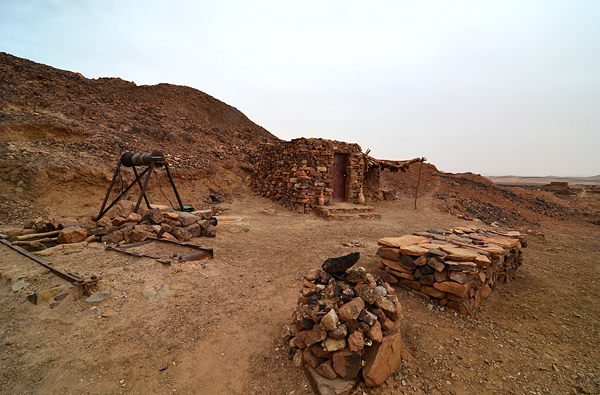 We arrived to Bou Azzer in the evening - quite unsual view to the Mining Center. P. Menducki photo. 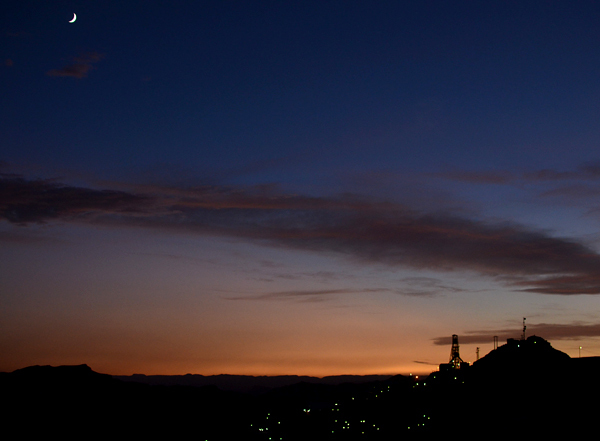 Evening view to the Bou Azzer Mining Center. P. Menducki photo. 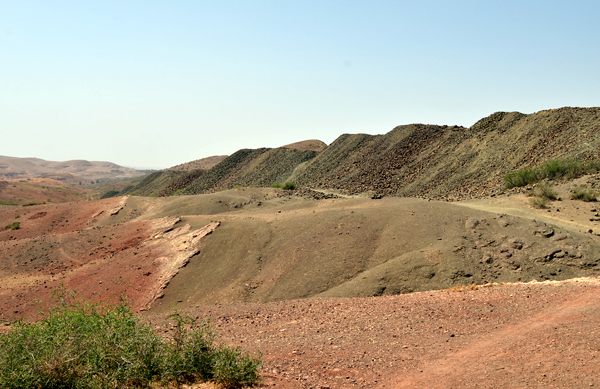 Landscapes in Ait Ahman area. P. Menducki photo. 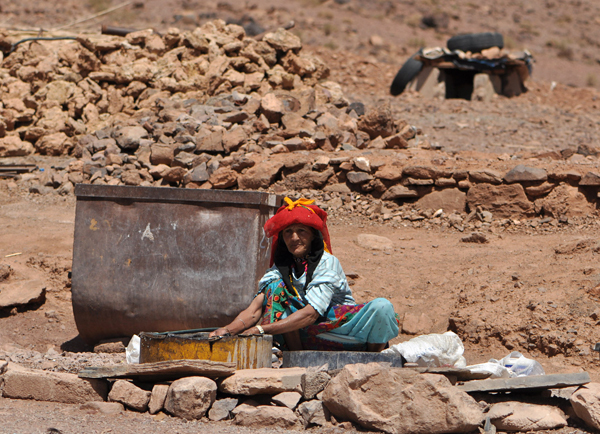 Berber woman making loundry using mining cart as a water tank. P. Menducki photo. 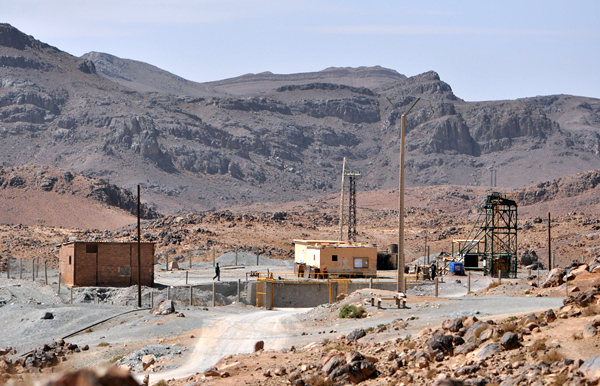 Taghouni mine. P. Menducki photo. 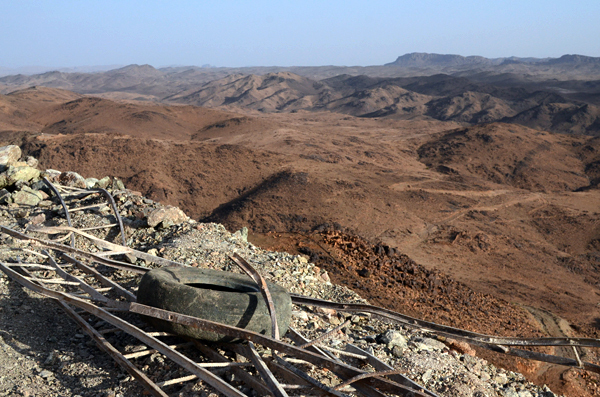 New research trench near to the Taghouni mine. P. Menducki photo. 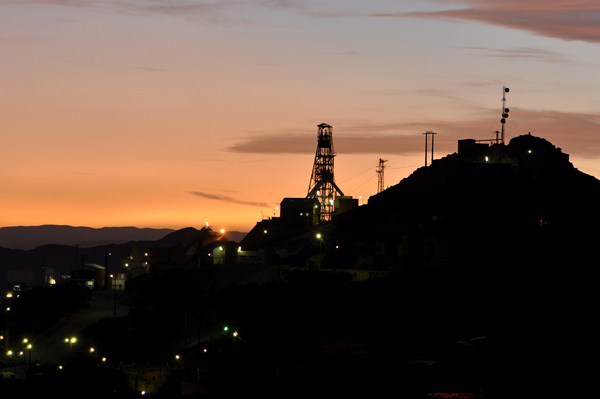 Bouismas mine. P. Menducki photo. 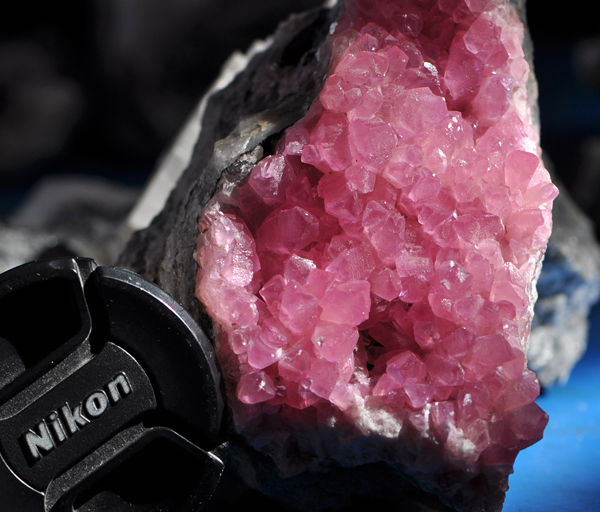 Selecting roselite specimens from Aghbar mine. P. Menducki photo. 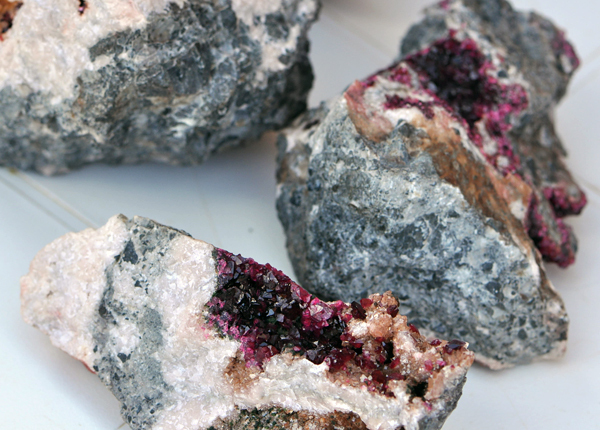 Roselites from Aghbar mine. P. Menducki photo. 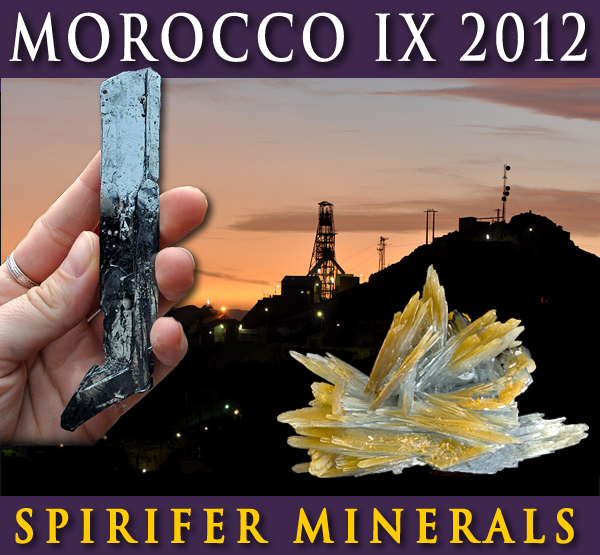 New co-calcites from Agoudal mine. T. Praszkier photo. 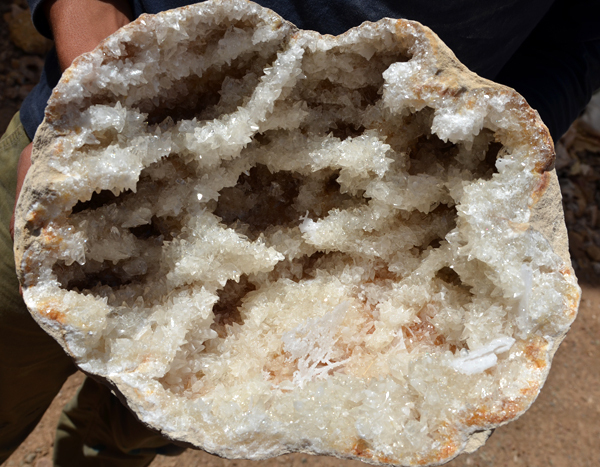 Co-calcite from Agoudal mine. P. Menducki photo. 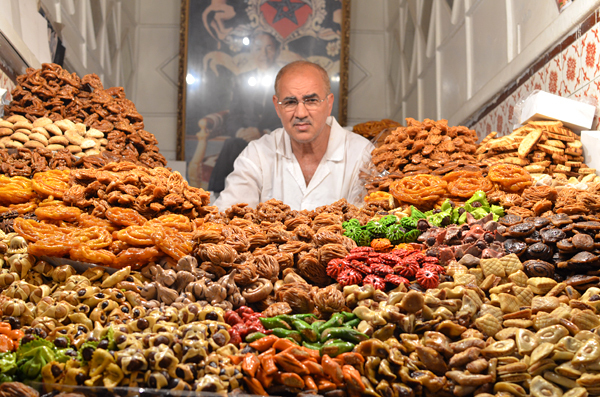 New gersdorfites from Ait Ahman. P. Menducki photo. Going east we stopped in Anif area for fossils. Google Maps. Going to the East from Bou Azzer we stopped in Nkob village. P. Menducki photo. 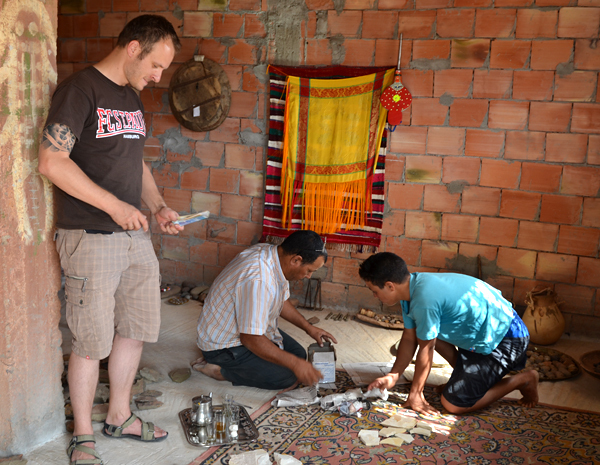 In the Alnif area we visited fossil dealers, fossils are Piotr`s speciality. T. Praszkier photo. 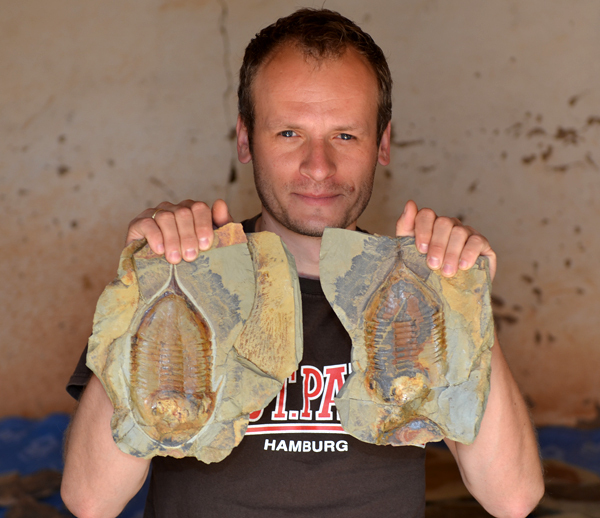 Alnif, Piotr with trilobite. T. Praszkier photo. Createceous fish. T. Praszkier photo. Deal is done! T. Praszkier photo. 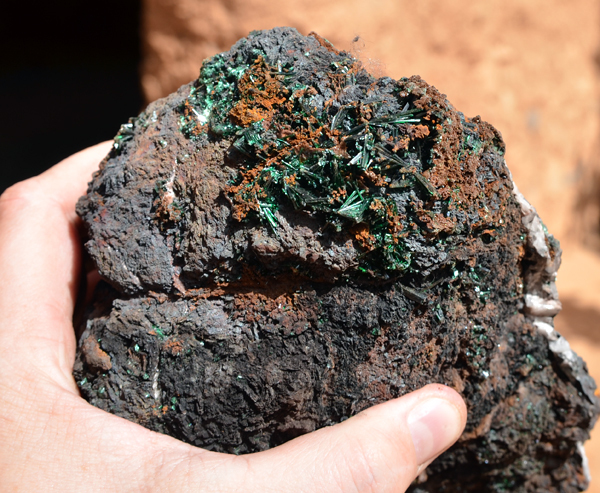 New malachite formed as acicular crystals up to 2 cm were found, probably in Oumjrane area. T. Praszkier photo. 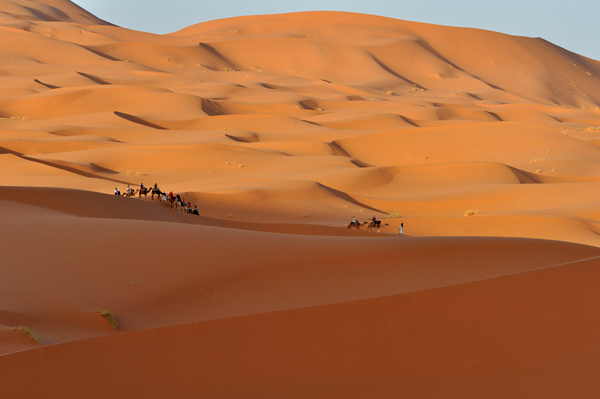 Finally we arrived to Erg Chebbi dunes. Google Maps. 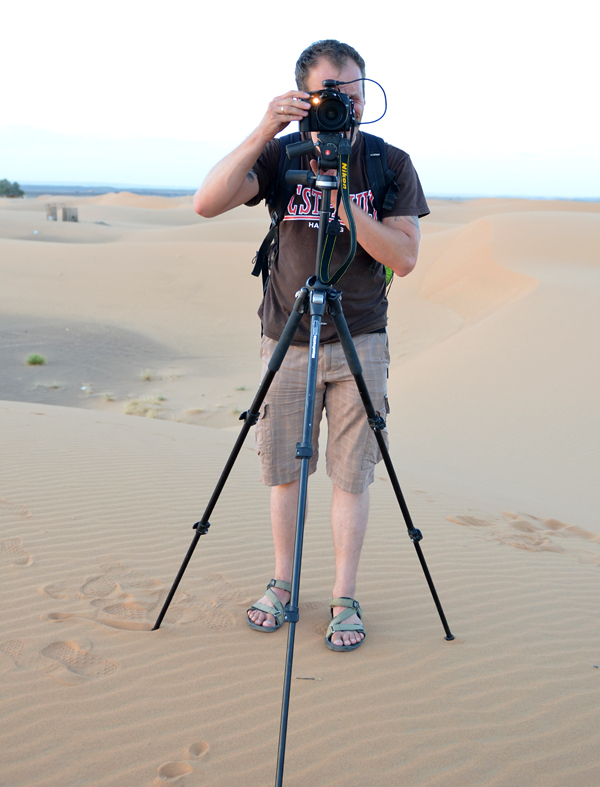 In the evening we arrived to the western part of Erg Chebbi dunes, great moment for photos. P. Menducki photo. 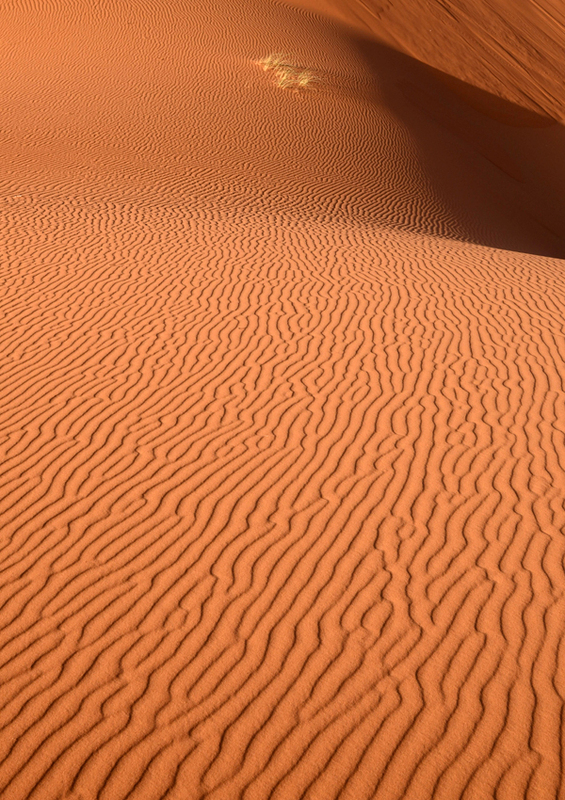 Taking photos on the dunes. T. Praszkier photo. 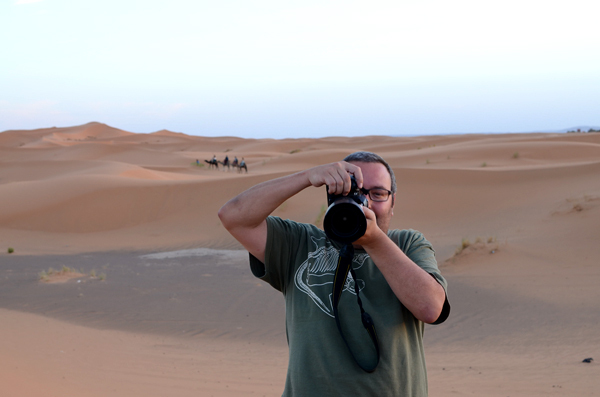 Taking photos on Erg Chebbi. P. Menducki photo. 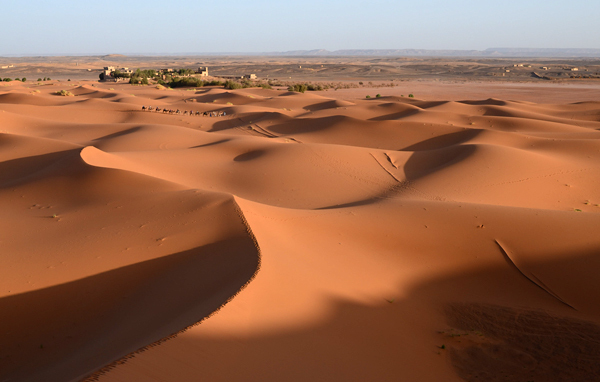 Erg Chebbi. P. Menducki photo. 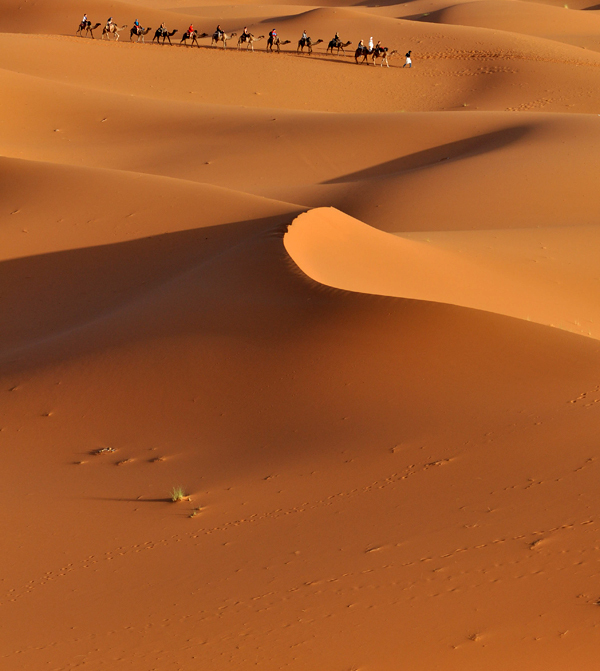 Caravane at Erg Chebbi dunes. P. Menducki photo. 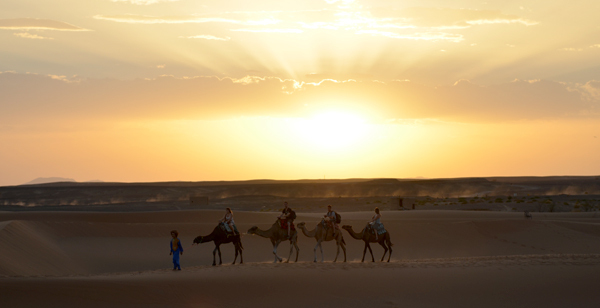 Sunset on Erg Chebbi. P. Menducki photo. 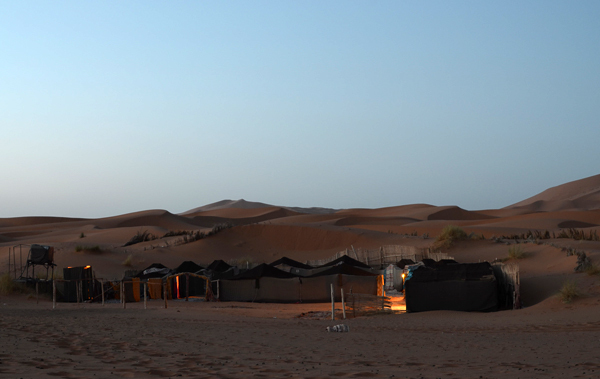 Berber tents on the dunes. P. Menducki photo. 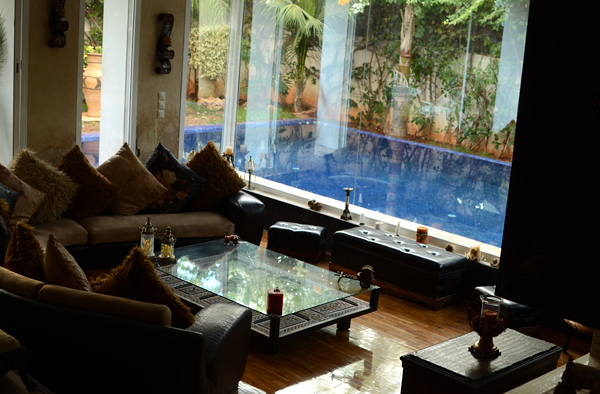 Yasmina hotel - another place we visited fixing the last details for the Conference. P. Menducki photo. 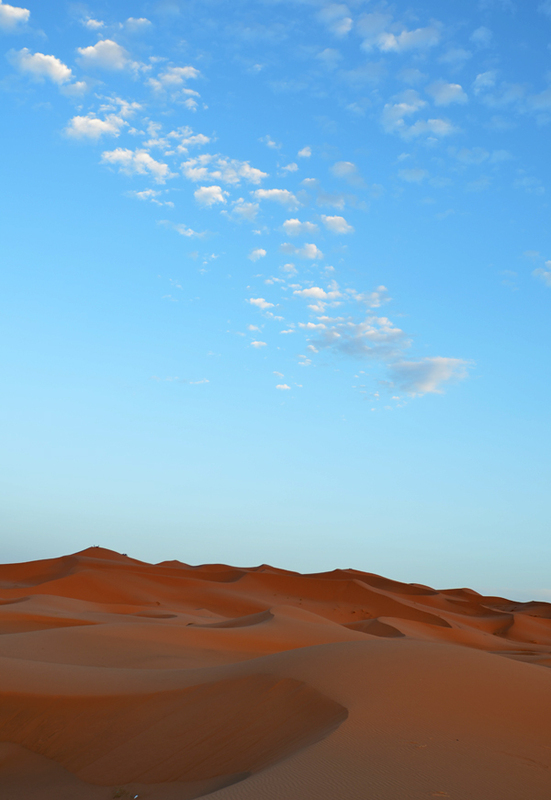 Morning view to the dunes around Yasmina hotel. P. Menducki photo. 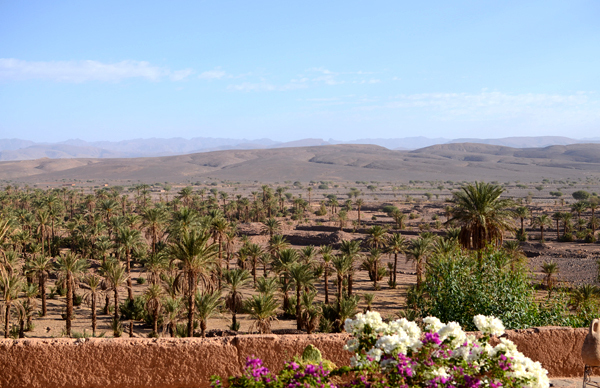 View from the high dune to the Yasmina hotel. P. Menducki photo. From there we made a trip to Taouz. 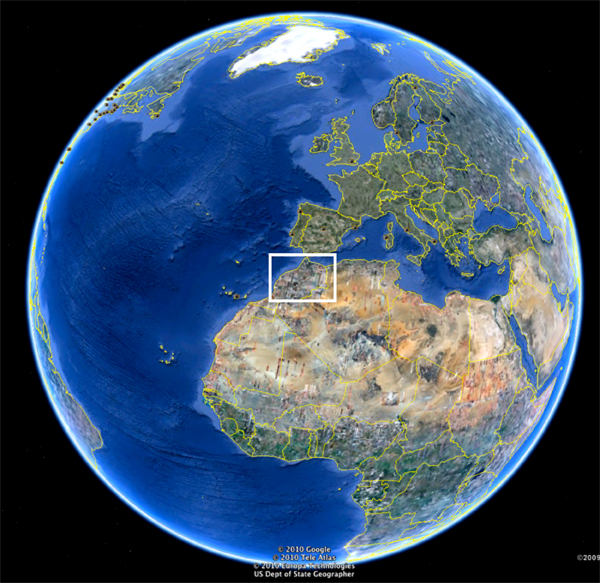 Google Maps. In Taouz we also fixed details of the visit during the Conference. P. Menducki photo. We also visited local friends. P. Menducki photo. 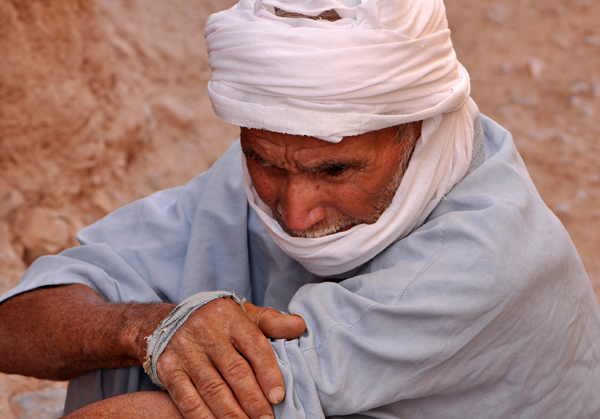 Miner from Taouz. P. Menducki photo. 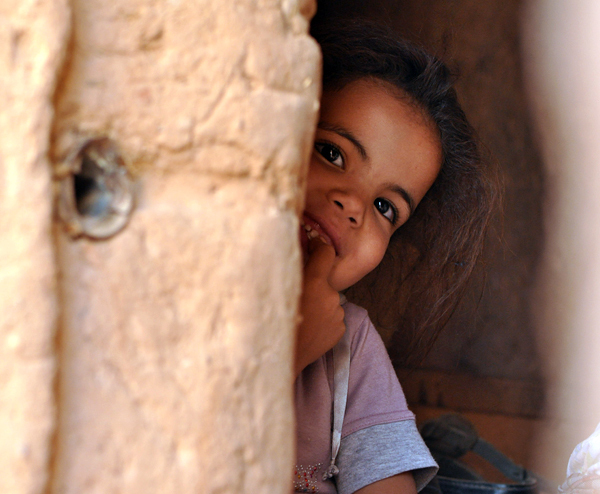 In Taouz village. P. Menducki photo. New mottramites on Mn-oxides from Taouz. T. Praszkier photo. New unusual yellow vanadinites from Taouz. T. Praszkier photo.